Scientists are catching crocodiles and sampling their blood in the hope of finding powerful new drugs to fight human infections. Australian Adam Britton and US expert Mark Merchant spent the last fortnight combing the Northern Territory for salt and freshwater crocs. It has been known for some time that these animals heal serious injuries rapidly and almost without infection. More recently, tests showed alligator blood has strong antibacterial powers. Dr Merchant said there was a wealth of anecdotal evidence suggesting that alligators and crocodiles are resistant to bacterial infection. "These animals are very territorial and when they fight it gets very ugly. "They tear limbs off one another and leave huge gaping wounds. "And, despite the fact that they live in an environment that harbour potentially a lot of pathogenic microbes, these horrible wounds seem to heal up very rapidly and almost always without infection." About three and a half years ago he tested alligator blood and pinpointed why these animals were so resistant to infection. Alligators and crocodiles, like humans, have a natural defence system against invading bacteria, viruses and fungi, which involves a group of proteins called the complement system. When Dr Merchant exposed the alligator blood to pathogens such as HIV, West Nile Virus and E Coli, it started to kill them. "It turns out that this complement system is much more effective than ours. "But there is really no clinical utility because I can't isolate them from alligators and inject them into your veins because your body would recognise that it was not human." Instead, he hopes to be able find something in the crocodile and alligator blood that can be mimicked in a drug, and has begun to look at white blood cells - the cells that flock to fight invading pathogens. White blood cells make and release tiny proteins to fight the infection and Dr Merchant believes that, if he can isolate these from the animals, it might point a way to making new antibiotics and antiviral drugs for humans. 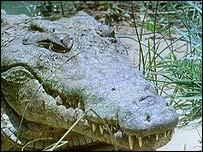 "We caught nine large, wild saltwater crocodiles and bled some 15 or 20 captive fresh and saltwater crocodiles. "I have isolated the white blood cells and cracked them open to look at the proteins." He is now waiting for the samples to be shipped back to his lab at McNeese State University in Louisiana in the US so he can carry out further tests over the coming months. The next step would then be to make similar proteins and see if they could kill bacteria, fungi and viruses that are a problem in humans, such as HIV and Staphylococcus aureus - the bacterium that has become resistant to antibiotics and has been causing so-called MRSA superbug outbreaks in hospitals around the world.